Dar al Salam Clinic. On this day in March most of the patients refused to be photographed because they believed I was a member of the CIA. This clinic is closing soon due to lack of funding. All of the men in this section are supporting the Revolution.The ones who recover from their injuries will go back to Syria to fight with The Free Syrian Army. Many of the men will help the cause in some other capacity. Irbid, Jordan. Feb., 2013 - Ahmad 47, from Dara’a, Syria. 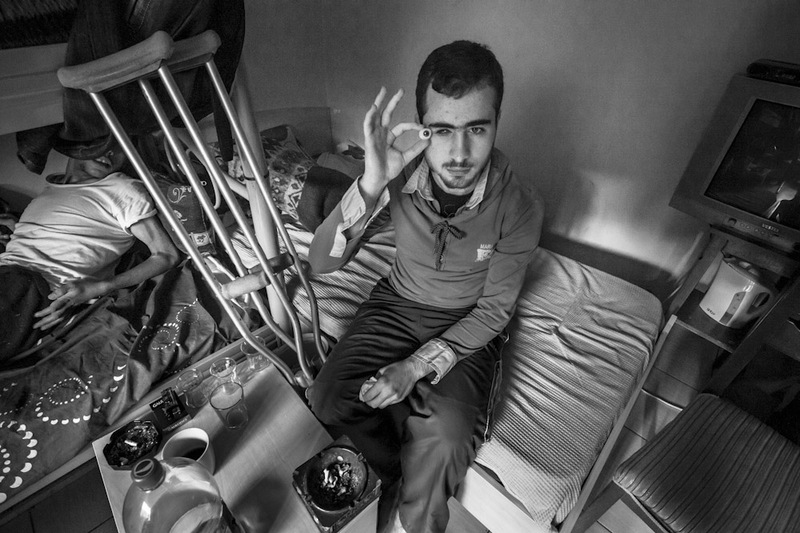 Ahmad is a nurse and is a member of The Free Syrian Army. In November 2012, he was helping to rescue a victim of a bombing carried out by The Syrian Army of President Bashar al-Assad. He was hit by a sniper's bullet and is paralyzed from the waist down. The Free Army brought him to Jordan on the same day. He views the valley that is between Syria and Jordan from his window in Irbid, Jordan every day. It takes 4 hours to cross the valley and members of The Free Syrian Army, victims of the conflict, and refugees are shot at by the Syrian military for most of the journey. Before Ahmad was shot he saw many people in hospitals who had been tortured and killed by the Regime. The sick and injured stopped going to the hospitals because they would be arrested by the Regime’s men if they sympathized with The Free Syrian Army. He lives in Jordan now with his family. In the early morning they can hear the shooting coming from the Syrian side of the valley. Reyhanli, Turkey. Feb., 2013 - Abdullah 31, from Hamah, Syria. Abdullah was shot in his left leg in Jan. 2013. He went to a private hospital in Syria. His leg became infected and the tissue began to decay. He was then taken to Turkey and now he is healing. Reyhanli, Turkey. Feb., 2013 - Omar, 19, from Aleppo, Syria and Alwahab, 16, from Hamah. Omar was injured in December 2012 and lost his right leg. He is now awaiting a prosthesis. He is very optimistic and thinks that the civil war will end in one month. He wants to return to Syria to teach carpentry. Alwahab was injured in November 2012 and is now awaiting a prosthesis. 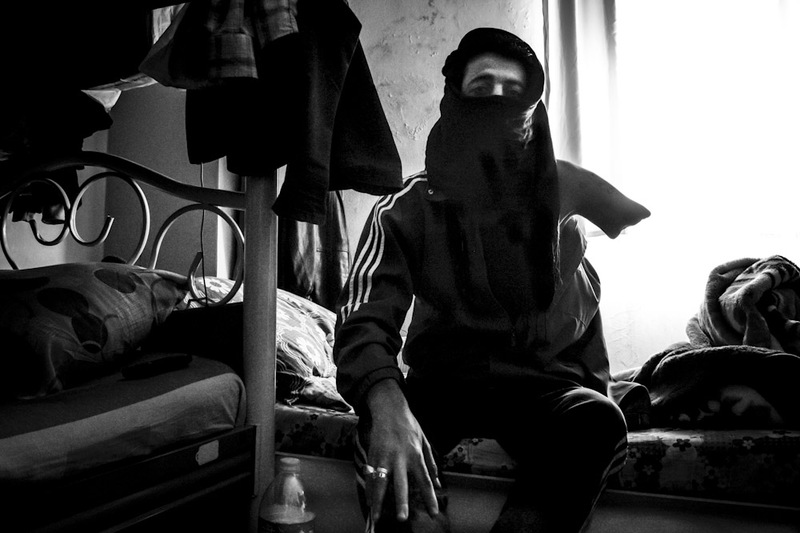 It is his dream to return to Syria and rejoin the fighting so that he can be a part of bombing the presidential palace. Reyhanli, Turkey. Feb. 2013 - Abdullah 20, from Idlib, Syria. 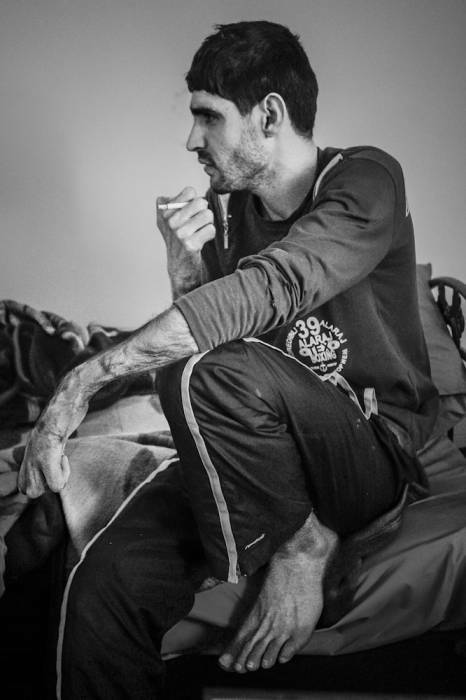 Abdullah has been with The Free Syrian Army since the beginning of the Civil War in March, 2011. Fifteen days earlier, his cousin was killed in a battle. Abdullah was part of the unit assigned to evacuate his cousin. While carrying his body, he was shot in the back and is now paralyzed from the waist down. He wants to go back to Syria and become a teacher. Amman, Jordan. March, 2013 - Mahmood 26, from Damascus. 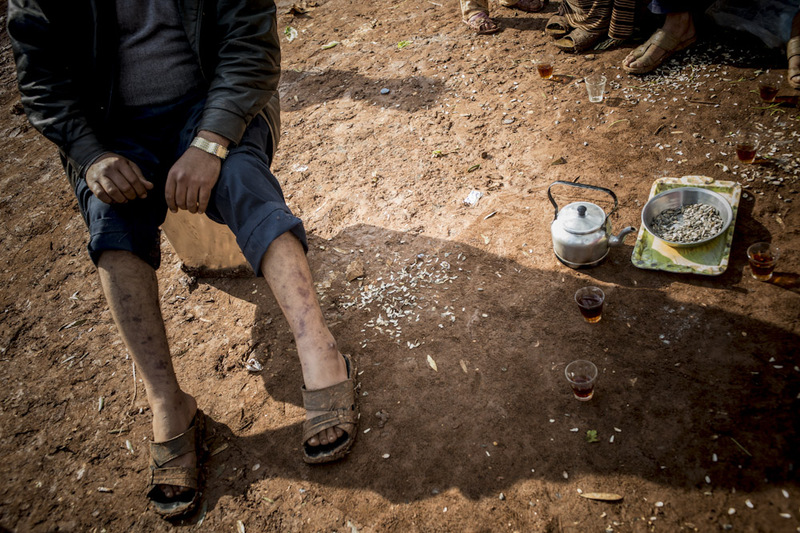 Mahmood was shot in the leg by a sniper from the Syrian regime in December 2012. His family spent 16 frantic hours going from one hospital to another trying to find a doctor. Many of the doctors working with the revolutionaries have fled or been killed. Finally, they found one, but 7 days later his leg had to be amputated. 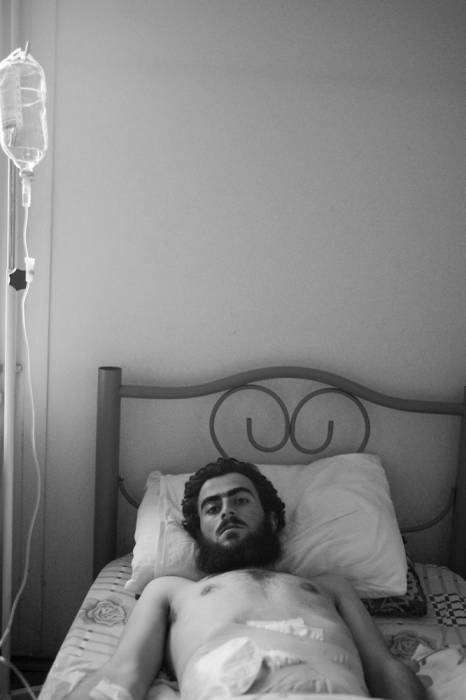 People associated with The Free Syrian Army cannot go to a state supported hospital for fear of being taken prisoner. The doctors and nurses who are pro revolution are being imprisoned or killed. Most health care workers have had to emigrate to neighboring countries Jordan, Turkey and Lebanon. Amman, Jordan. March, 2013 - Mohammed 22, from Dara’a, Syria. In January, 2013, Mohammed was working in Lebanon. He went home to Syria to visit his family and one morning he and other family members were standing in front of their home when a sniper working for the regime shot and killed 2 family members. 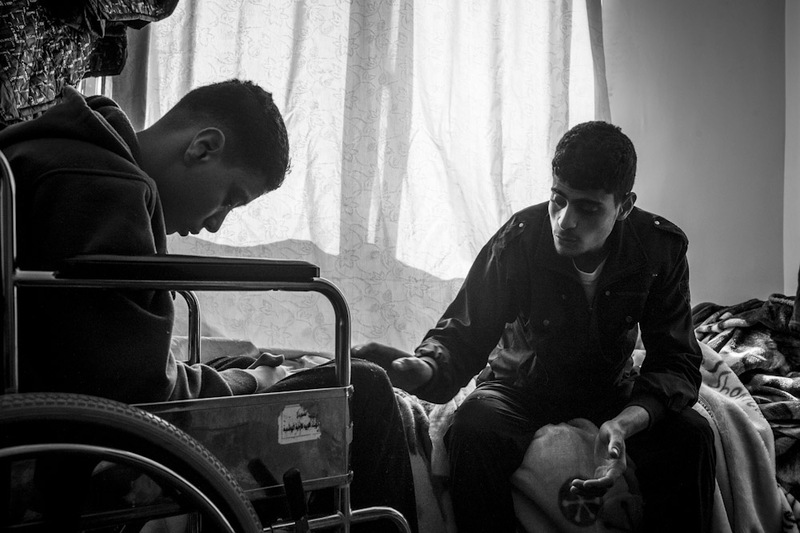 Mohammed was shot in the head and is now paralyzed on his right side. Amman, Jordan. Feb. 2013 - Abu Yasser, 72, and Shadi, 28, from Dara’a, Syria. 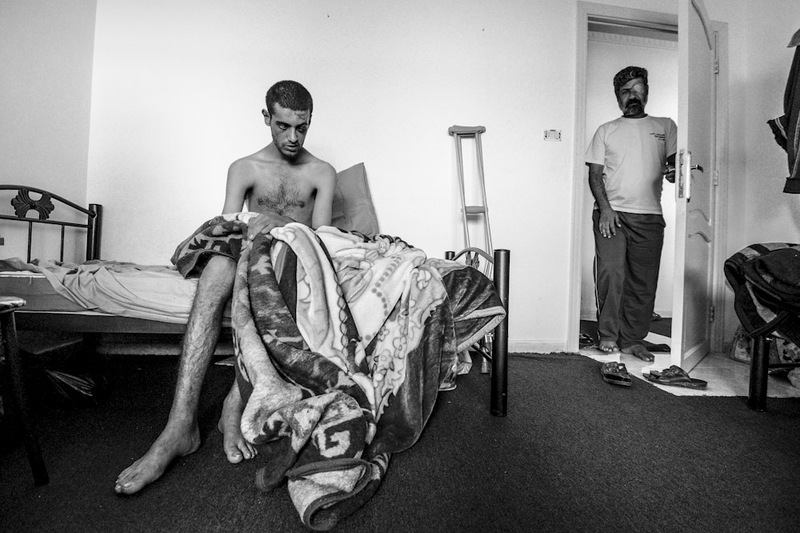 In April, 2011 men from the Syrian regime came to Abu Yasser’s home and killed two of his sons in front of him. Then they threw him down and stepped on his back and kicked him. Now he is partially paralyzed and wants to die. Sometimes he wishes he could go back to Syria to get revenge. Shadi, in May 2011 was put in a Syrian prison for no reason. Arab observers came to the prison to observe how the prisoners were treated. The guards at the prison told the prisoners not to tell the observers the truth about their cases and their torture. After the observers left, the prisoners were put on a bus and were being driven to the desert to be killed. The Free Syrian Army was able to save the bus and take the injured to Jordan for treatment. Amman, Jordan. Feb., 2013 - Hassan 27, from Dara’a, Syria. Hassan was imprisoned by the regime of President Bashar al-Assad for 6 months and 15 days. For days at a time his body was stretched on a table and was electrocuted in both arms until the skin broke open. He eventually went into a coma and he and the bodies of 11 other prisoners were taken to a garbage dump in Hamah, Syria. Later, the Free Army liberated the area and Hassan and one other man were found still alive. Hassan is now helping Jumana Bazboz of The Syrian Women's Association. He assisted in selecting the widows and families from Zatari Refugee Camp who were to be sponsored by the organization to move to Amman, Jordan for the duration of the civil war in Syria. Reyhanli, Turkey. March, 2013 - Elan 48, from Homs, Syria. Elan was participating in a street demonstration against the regime of President Bashar al Assad in March, 2011. He was shot in the head and the bullet is still lodged behind his right eye. He has had several operations, but still suffers from grueling headaches. Reyhanli, Turkey. March, 2013 - Motaz 27, from Homs, Syria. 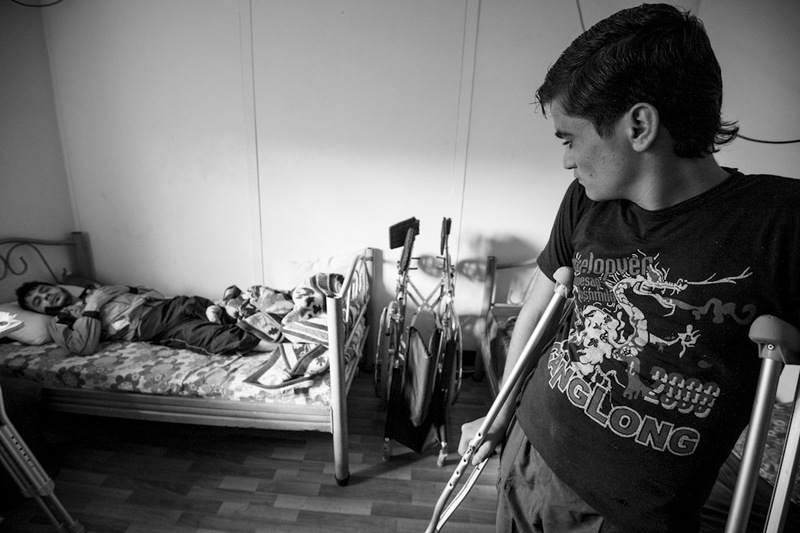 In September, 2012 Motaz was walking on the street in Homs and was wounded by a grenade. He is waiting for a prosthesis. Amman, Jordan. Feb., 2013 - Basil 21 and Naser 16, from Dara’a, Syria. Basil and Naser are brothers. In the evening of June 15, 2012 the brothers were ambushed when they were going home on their motorcycle. They were both shot. Then, 21 soldiers from the forces of President Bashar al-Assad surrounded and tortured them. Basil had both legs broken and lost one of his eyes. Naser is now paralyzed and extremely depressed from from the beating. Being the older brother, Basil blames himself for Naser’s suffering. Reyhanli, Turkey. Dec., 2012 - Dar Al Salam Rehabilitation Clinic. Mohammed, Ramez and Saifaldin are soldiers with The Free Syrian Army. 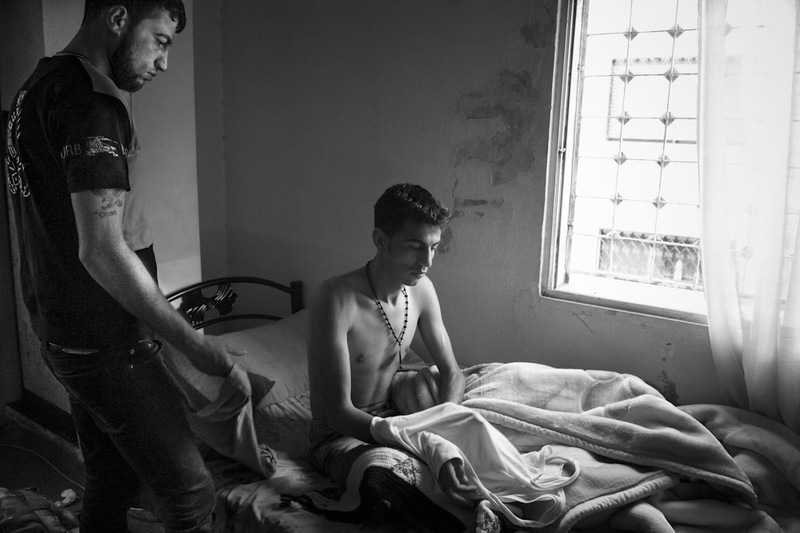 Mohammad, 21, from Homs, was shot in the chest. Homs was surrounded by the Regime of Bashar al-Assad's military, but there is an ancient sewage system that the Free Syrian Army uses to smuggle their wounded out of the city. The only problem is that it takes 6 hours walking in total darkness to reach medical help. Ramez, 45, is from Homs, Syria. He was shot by a sniper in Sept. 2012 and was also taken to the border with Turkey by the sewage route. His family soon joined him in Turkey. His son Aiman, 5, has been with him everyvday. Saifaldin, 60, is from Homs, Syria. He was wounded by a missile that killed 7 and wounded many. Reyhanli, Turkey. Dec., 2012 - Dar Al Salam Rehabilitation Clinic. Mohammed, from Aleppo, Syria. While a soldier with the Syrian Army, he defected on July 20, 2012. Men from the Air Force Intelligence agency, the most brutal intelligence group in Syria, came to his home and took him as a prisoner. They broke his left arm, he was electrocuted, and he was waterboarded. The guards brought a picture of President Bashar al-Assad and ask him to worship it. Mohammed refused, and it was then that a screwdriver was used to remove his eye. After one month his family paid to have him released. Irbid, Jordan. Nov., 2012 - Mofid is from Homs, Syria. The family did not want to talk about the incident that had paralyzed their son. Irbid, Jordan. Dec., 2012 - Amjad, from Dara'a, and Mohammed. Mohammed is with The Free Syrian Army. He was shot by a member of The Syrian Army as they were exiting a bus together in Dara'a. 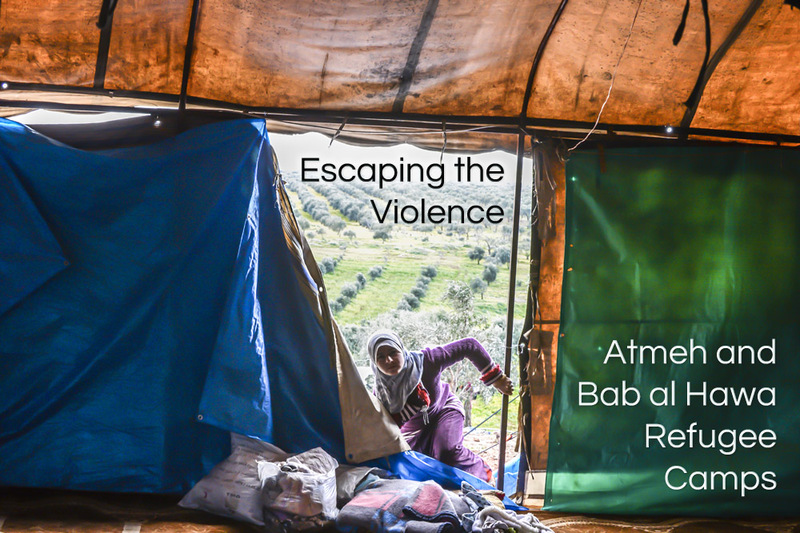 Atmeh Refugee Camp has 14,000 refugees during the day and 4,000 at night. 10,000 go back to their homes at night because it is relatively safe. During the day is when most of the bombing takes place. The camp is divided into 5 sections. Each has a leader who distributes food and supplies. In November of 2012 there were no toilets. The women and children had to walk to the olive groves to find privacy. 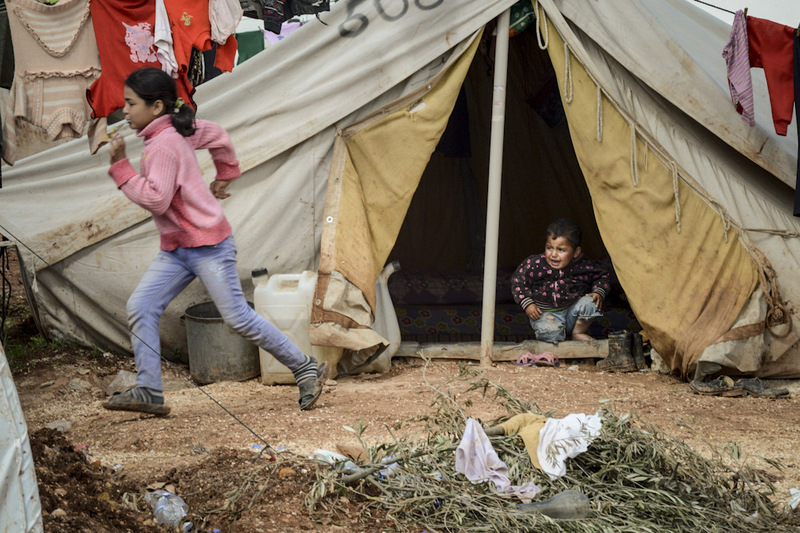 Bab al Hawa Refugee Camp is in Syria just a short distance from the Syrian-Turkish border in Idlib Province. The Free Syrian Army set up the camp and there are several NGO’s that help support different functions and needs of the displaced. Bab al Hawa Camp opened before Atmeh Camp, which was shortly after Turkey closed their border to refugees wanting to enter refugee camps within Turkey. The families that are living in this camp are predominantly from Aleppo, Homs and Idlib. Atmeh, Syria. 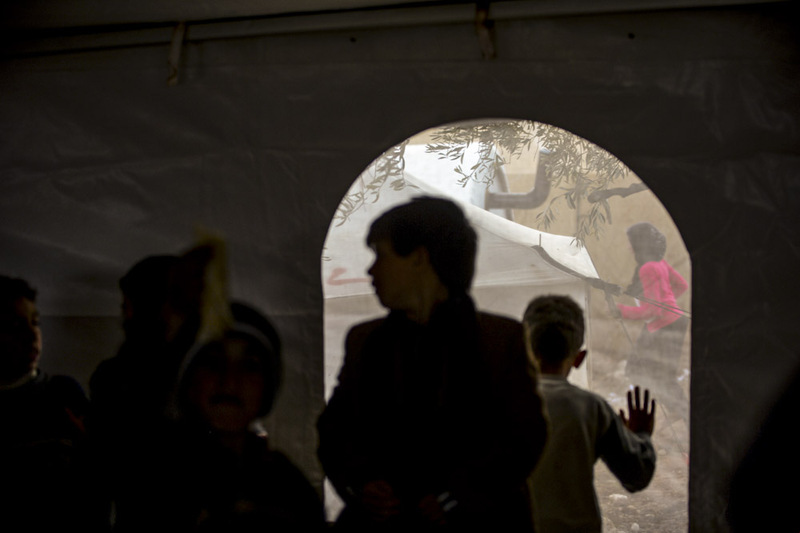 March, 2013 - Atmeh Refugee Camp. This family had just arrived at Atmeh Camp. Atmeh, Syria. March, 2013 - Atmeh Refugee Camp. Looking through a window from the inside of a tent. This tent was one the makeshift schools. Atmeh, Syria. March, 2013 - Atmeh Refugee Camp. The older children look out for the younger ones. Bab Al Hawa Refugee Camp, Syria. March, 2013 - This man’s wife had triplets in February 2013. Three girls, born in the Refugee Camp. Atmeh, Syria. Nov., 2012 - Atmeh Refugee Camp. 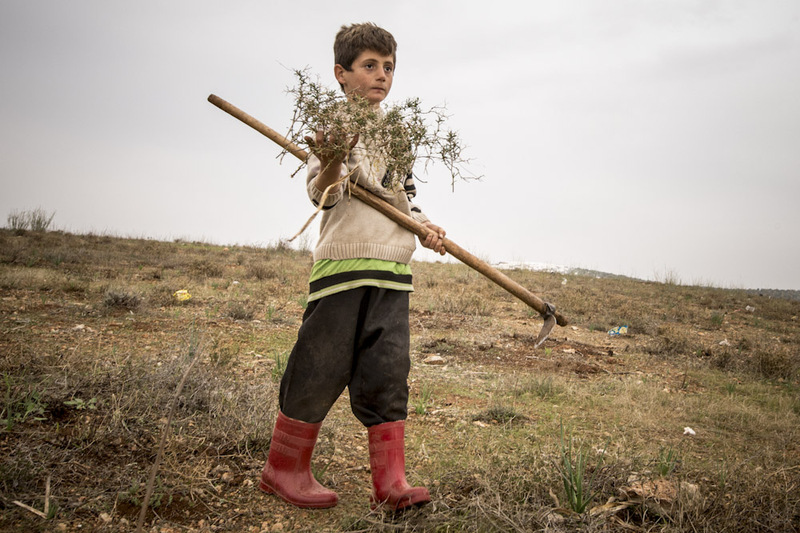 A boy gathers weeds to be used as fuel for the fire. Atmeh, Syria. Nov., 2012 - Atmeh Refugee Camp. 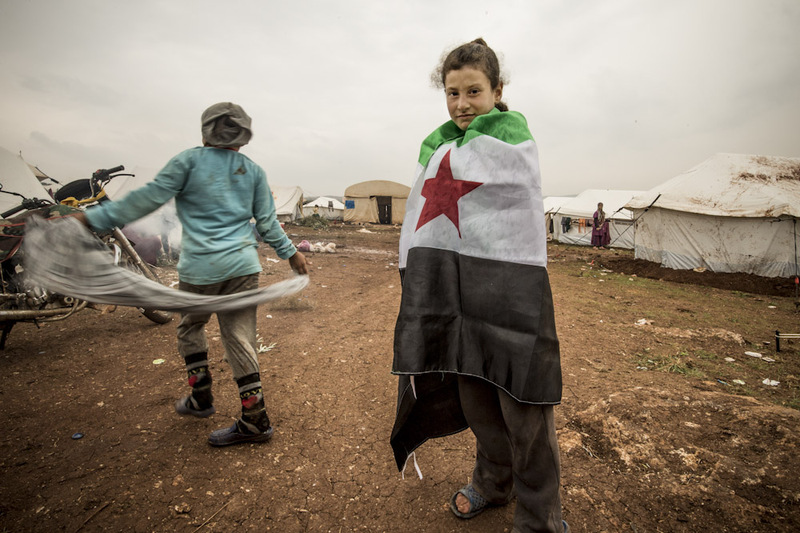 A young girl wraps herself in The free Syrian Army Flag. Atmeh, Syria. Nov., 2012 - Atmeh Refugee Camp. 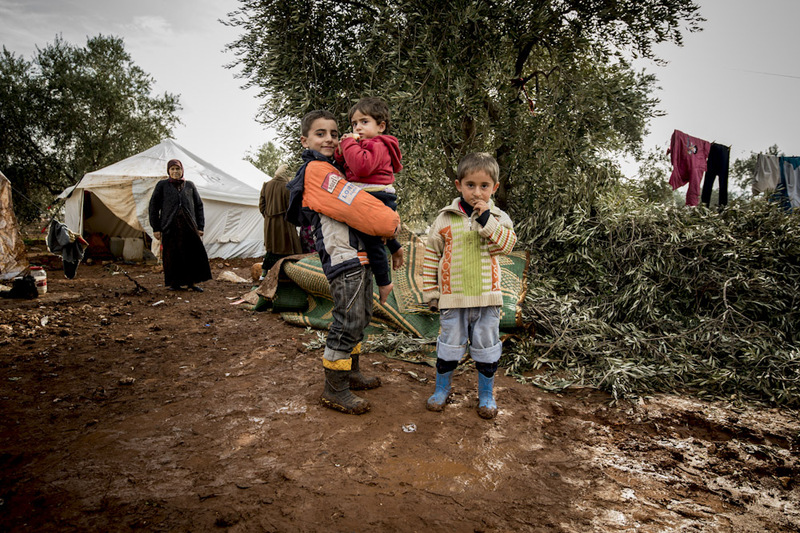 Refugee children standing under one of the thousands of olive trees in the area of the camp. Atmeh, Syria. Nov., 2012 - Atmeh Refugee Camp. 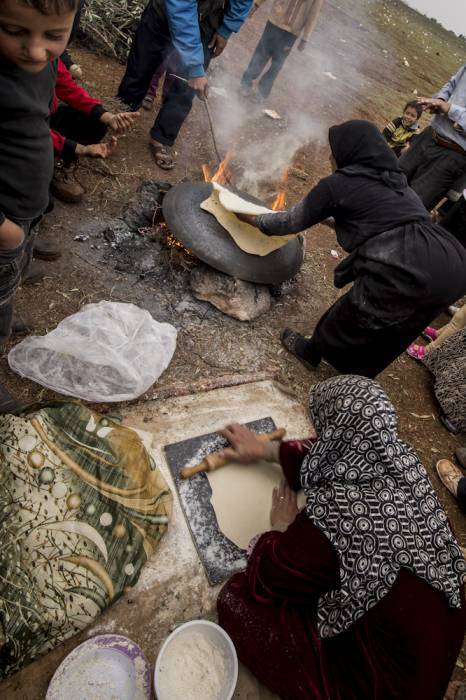 These women were making bread for several families in the camp. Atmeh, Syria. Nov., 2012 - Atmeh Refugee Camp. 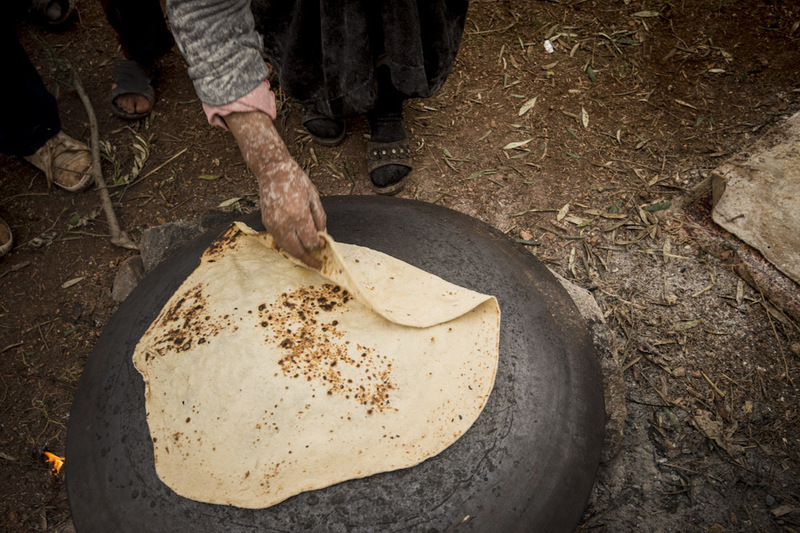 Making bread over a fire in the camp. Atmeh, Syria. Nov.,2012 - Atmeh Refugee Camp. A man showing cigarette burns on his legs. He had been tortured in a Syrian prison. Atmeh, Syria Mar., 2013 - Atmeh Refugee Camp. 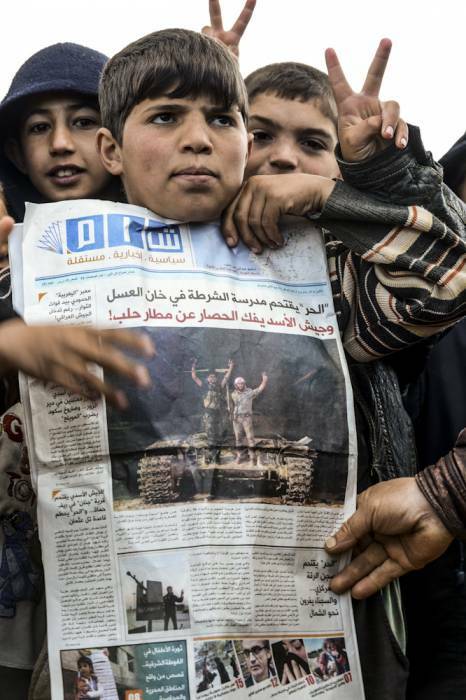 Children in the camp were very proud of the Free Syrian Army Soldiers. Atmeh, Syria. Nov., 2012. Atmeh Refugee Camp. The camp is located in the middle of a large olive grove. November is the time of the olive harvest. This section of the project, Breaking Apart, is a collection of photos and stories of men, women and children, some with documents and some without. Almost all of the individuals are living in temporary housing provided by organizations. However, many safe havens have been funded by private conscientious individuals from neighboring countries. Most private donations are funneled through larger groups. As an example, one Saudi man donated 1 million dollars to The Syrian Women's Organization to provide housing and provisions for widows and orphans of the Syrian conflict in Amman, Jordan. The situations vary, but all stories involve kindness and sacrifice, not to mention an enormous amount of hard work by volunteers. Reyhanli, Turkey. Dec. 2012 - Sirham, 23, from Latakia, Syria. Sirham was attending a meeting with 4 other female activists in September, 2012. The home where they had gathered was the target for a rocket attack from The Syrian Army. 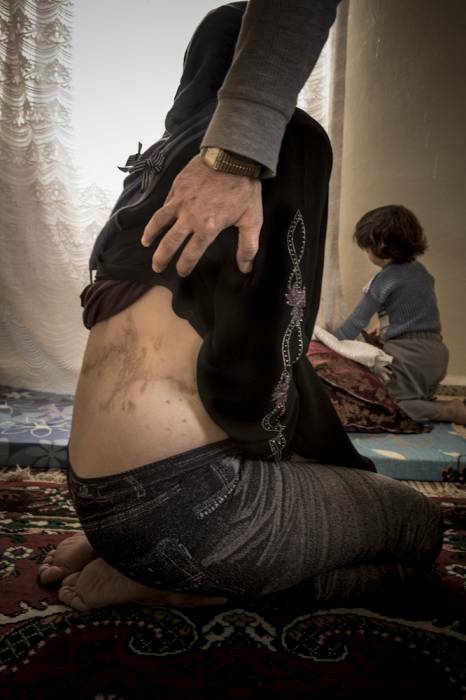 One woman was killed and Sirham received shrapnel to 40% of her body. 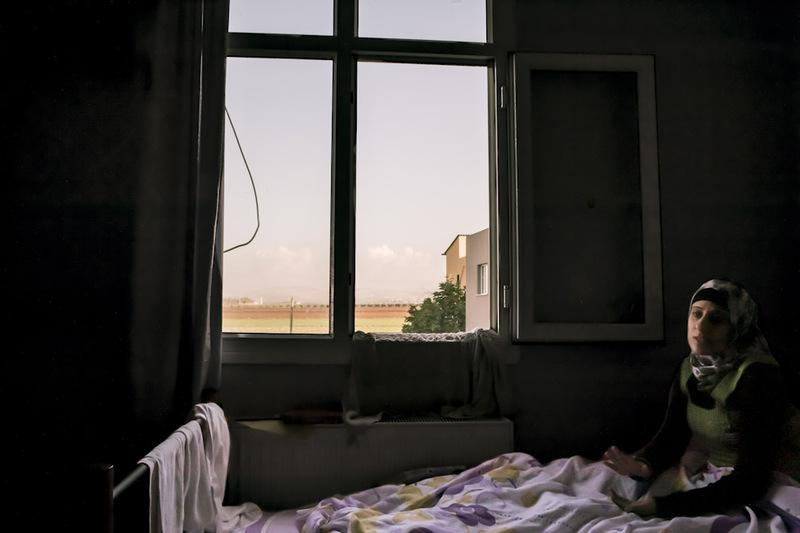 She is able to see the border of Syria from her window and hopes to return to the revolution soon. Reyhanli, Turkey. Mar. 2013 - Fawzia 41, from Houla, Syria. On May 25, 2012 the small village of Houla was surrounded by soldiers from the regime of President Bashar al Assad. She was in her home with 25 members of her family. They heard a knock on the door: It was neighbors who are from the Alawite sect, the same as President Bashar Al-Assad. Fawzia and her extended family are all Sunnis. Despite the difference, the neighbors had always been friendly. Not this time. The men started fondling the girls. The father tried to protect them and was shot in the head. Fawzia grabbed her 6 year old daughter as everyone else in the room was killed, many falling on top of her. The door was shut. She was unconscious for about an hour. When she raised her head her daughter, Hiba, grabbed her head and told her “They are still outside, play dead”. When Fawzia looked at her daughter she saw that she was covered with blood. She had covered her own face to pretend to be dead. Two hours later members of The Free Syrian Army arrived and took Fawzia and her daughter along with 108 other survivors from the village away. The death count was: 53 children, 49 women and 6 men. All of the animals had also been killed. Also, several of the children were missing. Perhaps the greatest tragedy of the conflict is what is happening psychologically to the children. Many of the refugee children are showing signs of mental breakdown. Hiba, Fawzia's young daughter has behavior swings from laughter, to crying, to acting out aggressively. There is no mental health care available in the camps or the clinics. This will affect this generation of children the rest of their lives. Often Fawzia has a recurring nightmare of her daughter running towards her, with her husband waving goodbye. Reyhanli, Turkey. 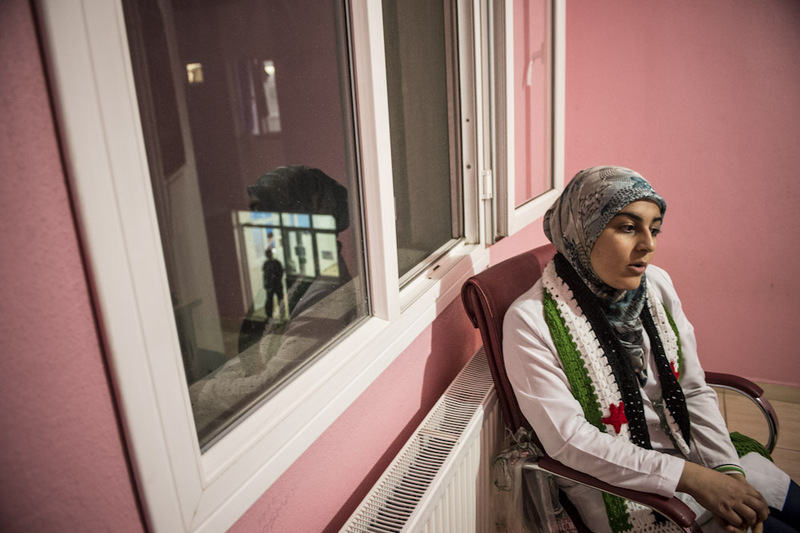 Nov., 2012 - Lamis is a nurse in a clinic in Reyhanli. She is from Aleppo, Syria. In November 2011 she went to a demonstration and was taken prisoner by the Syrian regime. She was tortured and abused for 5 days. Her family paid for her release after finding out her arm was broken and she was being electrocuted. Reyhanli, Turkey. March, 2013 - Missa 12, from Idlib, Syria. Missa was playing in front of her house with friends in September, 2012 when she was shot by a sniper. She is paralyzed from the waist down. Her father was shot and killed by the Syrian Army in January 2013. Her mother is with her now. Missa ‘s 4 other siblings were left in a cave near Aleppo. The oldest, her 16 year old sister, is responsible for their care. The children were last heard from a month ago. Reyhanli, Turkey. March, 2013 - Khadiya 19, from Hamah, Syria. In August, 2012 a missile struck the house where she, her husband and her 2 sons live. She is paralyzed from the waist down and has internal injuries. 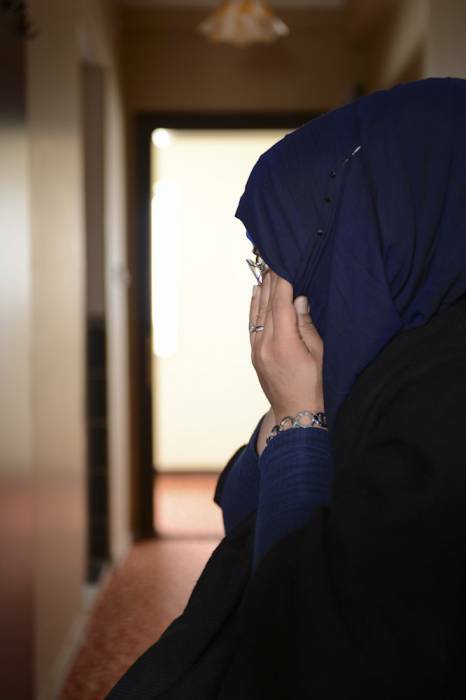 Khadiya has not seen her children since the incident. She does not want them to see her in this condition. Reyhanli, Turkey. March, 2013 - Noor from Latakia, Syria. In the spring of 2011, Noor was engaged to Ahmad. They were to be married on May the 20, 2011. 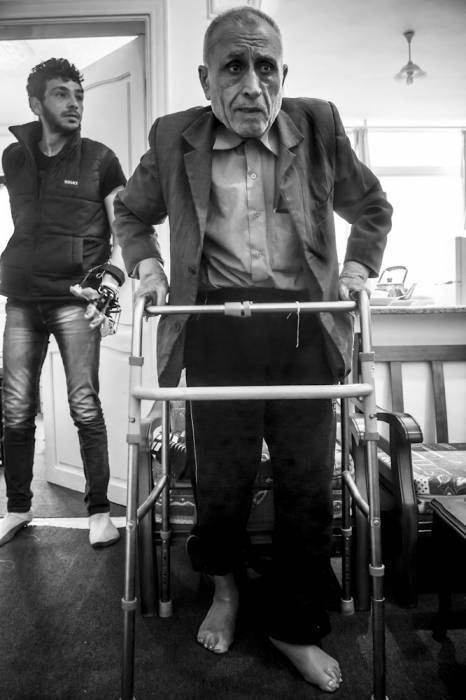 Ahmad worked taking medical supplies to a home clinic for The Free Syrian Army. On April 14, 2011 she accompanied him. One of her friends informed the Regime of what they were doing. They were stopped on the delivery, handcuffed, blindfolded and taken to an intelligence office and then to prison. The interrogators, from The Air force Intelligence [militia], who are responsible for the worst torture procedures in Syria, were trying to find out who Ahmad was working for and where the home clinics were located. From the 1st day they both were stripped completely naked and were tortured in front of each other. Noor was hung upside down and was beaten and electrocuted many times and burned over her entire body with cigarettes. In the next few days pliers were used to pull 7 of her teeth and her hands were broken. Her captors enjoyed her screaming. Then her fiance would be tortured and put in isolation. This routine lasted for 13 days then on the 27th they were taken to the office by three officers. Ahmad was continually asked the names of the terrorists that he worked for, he finally broke and told the officers everything that they wanted to know. She was then raped by all three men anyway. Next they raped him. The next day she was taken to his room and he was killed in front of her. Then she was raped again by different officers. On May 2, 2011 she was taken to court, the judge released her with a 25 dollar fine. Two weeks later Noor was asked to sign 3 blank sheets of paper upon doing so Ahmad’s body was finally released to her. The next day her brother was taken prisoner for three months. In October 2011 she was informed that the officials from the intelligence were coming to interrogate her again. 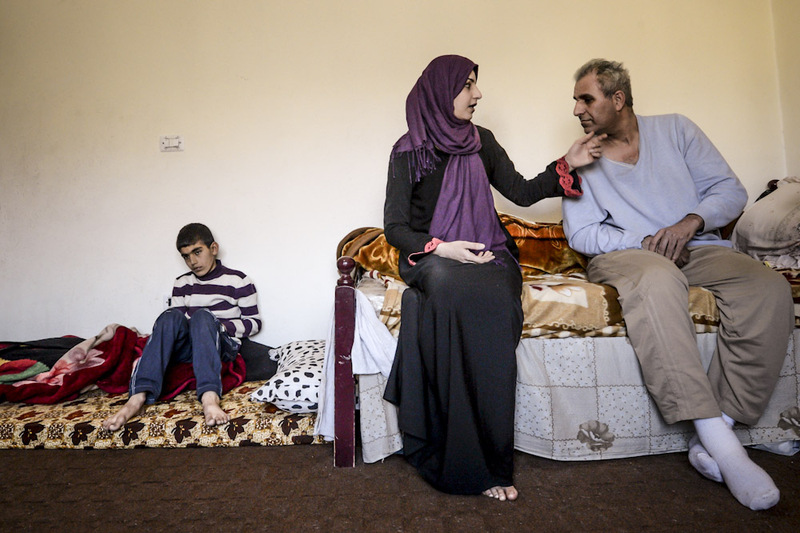 She was first smuggled into Lebanon and then into Jordan. Noor is now on medication for the internal injuries that she received. She told many stories of young girls being tortured in the prison. Noor is now living in Turkey and has started a women’s activist organization “Liberated Women of Syria.” They hope to help other women and girls that have had the same experience in Syrian prisons. Amman, Jordan. March, 2013 - Ayda and her mother 8, from Dara’a, Syria. Ayda’s father was handcuffed and taken from their home in December, 2012. They have not heard from him since. Ayda and her mother hope he is in prison and that they will see him soon. 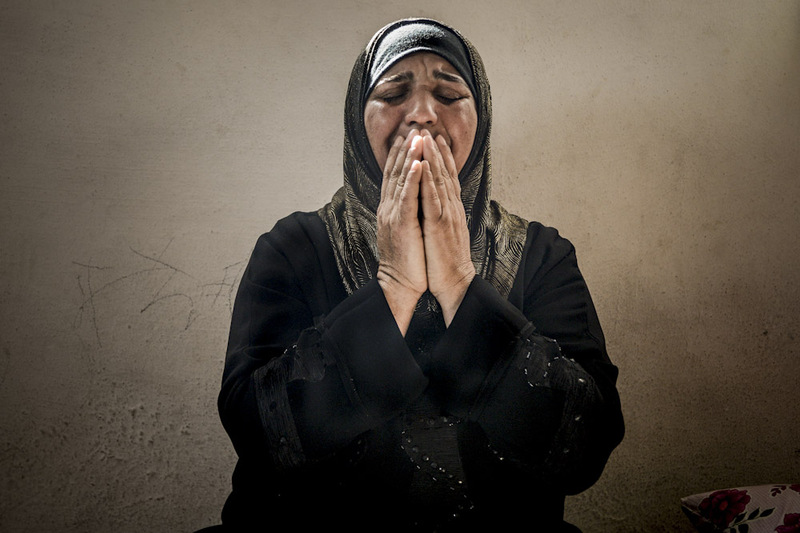 Her mother acted out how her husband was handcuffed by the Syrian Regime in front of her in their home. 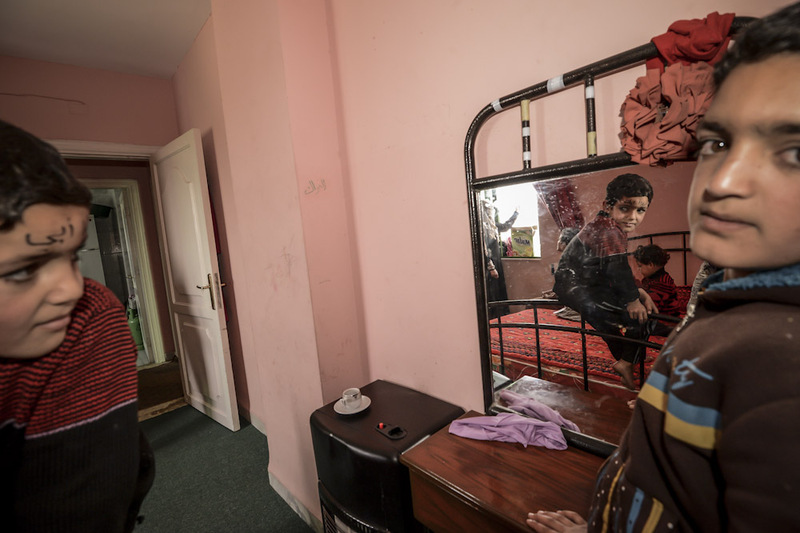 They are living in an apartment provided by The Syrian Women’s Association. Amman, Jordan. March, 2013 -Children of Khaled 41, from Dara’a, Syria. Khaled died in August 2012. He had 8 children. Two hundred and fifty men from different units of the regime’s forces invaded the compound where the family lived. Many of the men were not from Syria as they did not speak Arabic. They are thought to have been from Iran. The soldiers came in and took everything of value and destroyed the rest. Then all of the men were killed. The bodies were taken and returned 3 days later. All of the animals were also killed. 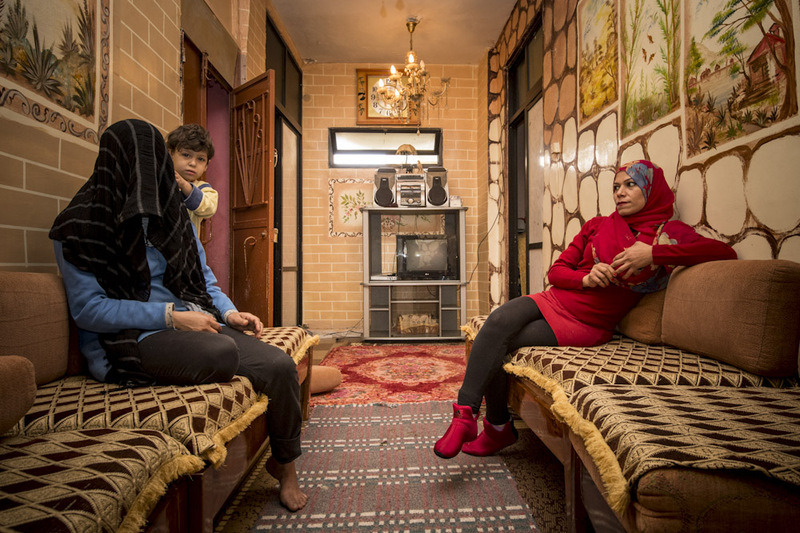 They are living in an apartment provided by The Syrian Women’s Association. Amman, Jordan. March, 2013 - Etaf 21 from, Dara’a, Syria. 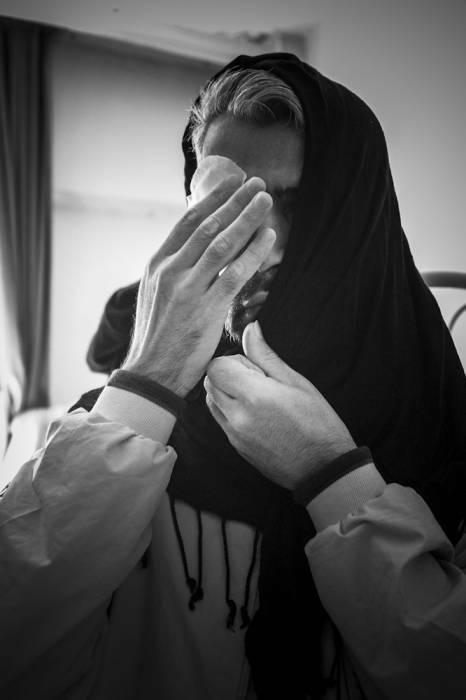 Etaf’s husband, Khalid, was killed in May, 2012. She has a son who is 20 months old now. On January 1, 2013 her in-laws took her son and will not allow her to see him. She is now living with her mother and 2 sisters in Amman, Jordan. The father died at the beginning of the war in March, 2011. The family is living in an apartment provided by The Syrian Women’s Association. Ar Ramtha, Jordan. 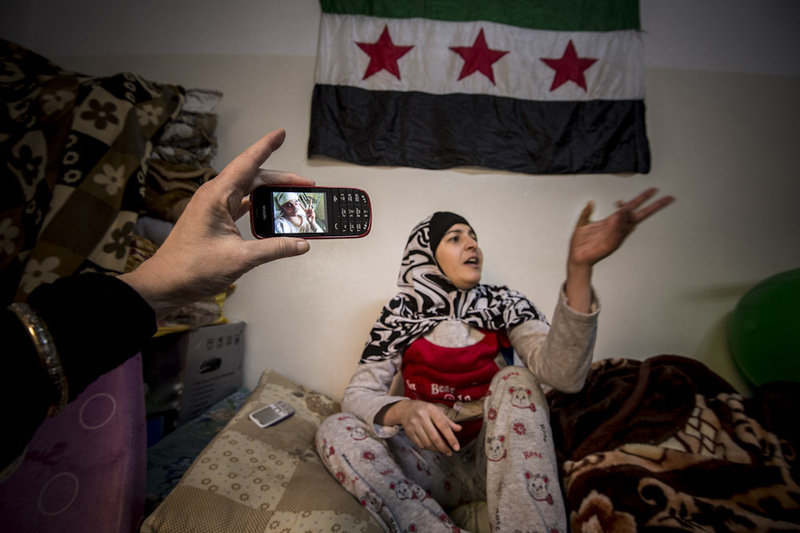 Nov., 2012 - Fatema, mother of 4 and a nurse with the Free Syrian Army, is from Dara'a Syria. She was shot by a sniper in August, 2013. Her family was told that she had no chance to live. 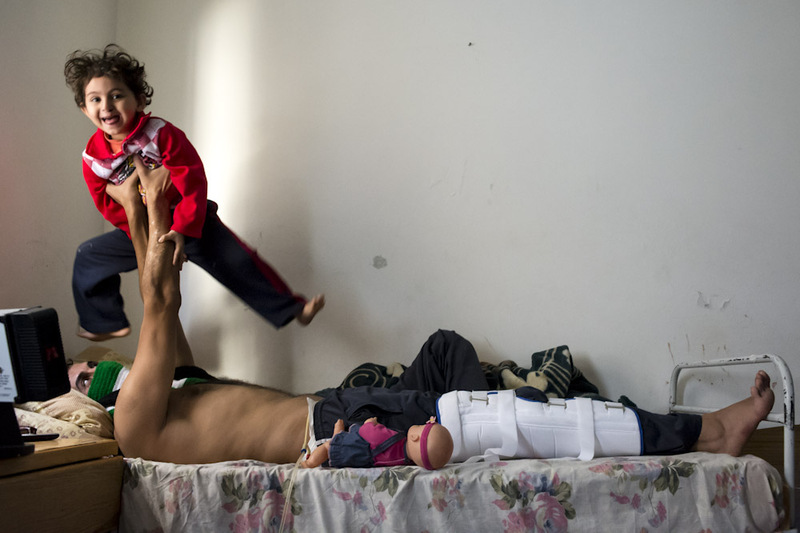 Fatema is determined to walk again and return to Syria to rejoin the revolution. Ar Ramtha, Jordan. Dec., 2012 - Hana is from Dara'a, Syria and has five children. 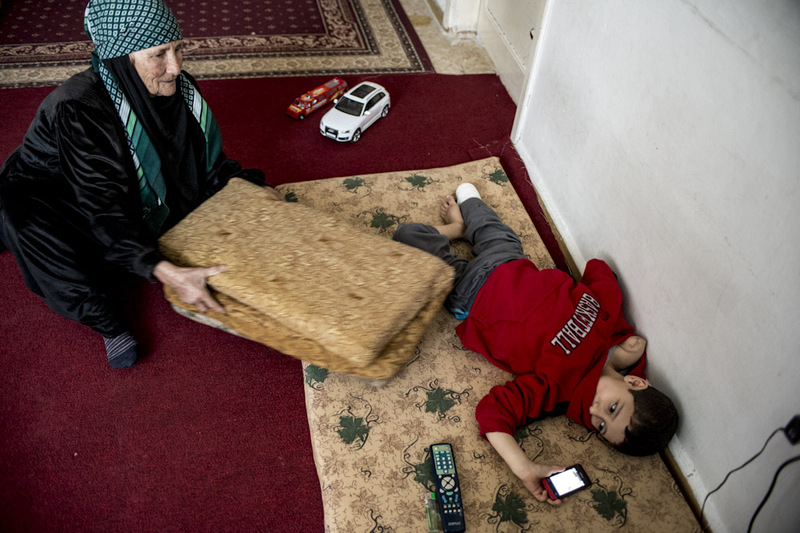 She and her children were injured when a rocket hit their home in October, 2012. Beirut, Lebanon. 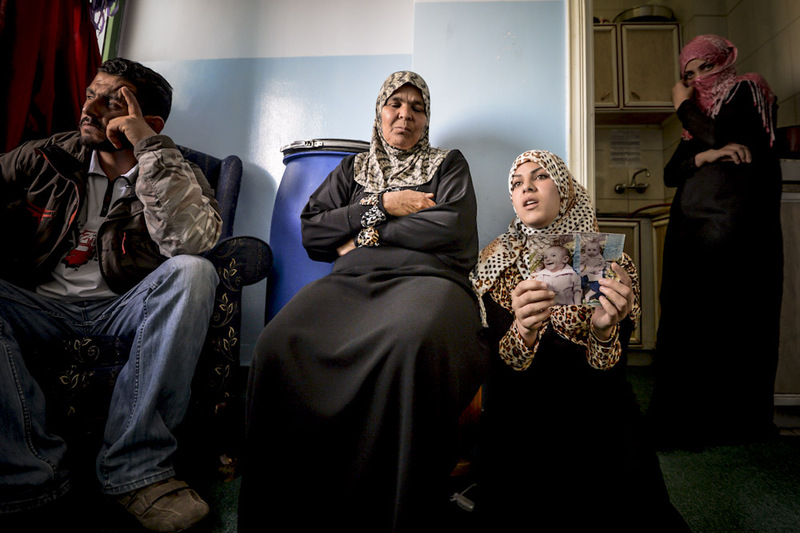 Dec., 2012 - Noor, a mother of 3 children and a Syrian Palestinian Refugee, had been taken in by a family in Shatila Refugee Camp in Beirut. Noor was born and lived her entire life in a Palestinian refugee camp in Damascus, Syria. Two weeks previously her house was burned to the ground and she left with her children the next day. It was an arduous journey to the border crossing with Lebanon and then to Shatilia Refugee Camp in Beirut, Lebanon. She arrived at Shatilia in the middle of a cold and rainy night and found a bus for them to sleep under. The next morning Husain, the bus driver, discovered them and took them to his home to stay until they can find an apartment in the camp. Noor's oldest child Ibraheim 10, is working in a grocery store making 2 dollars a day. Irbid, Jordan. 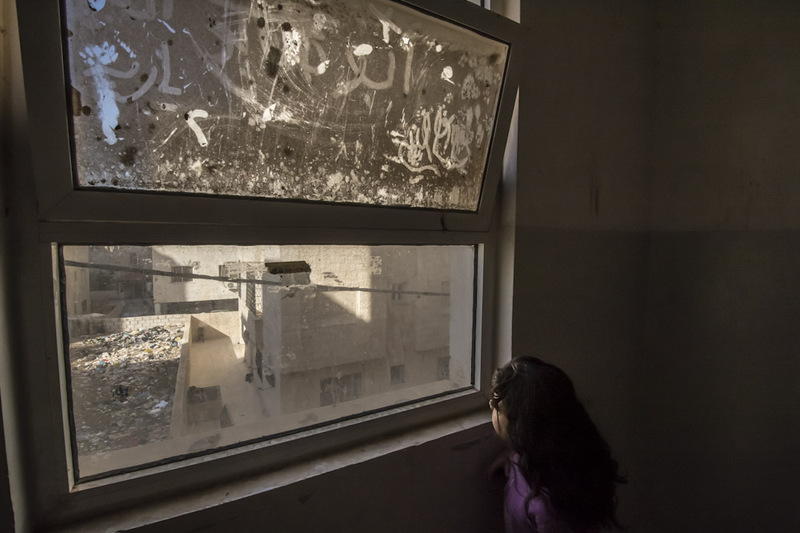 Nov., 2013 - Window in an apartment building in Irbid that is housing Syrian Refugees. Irbid, Jordan. 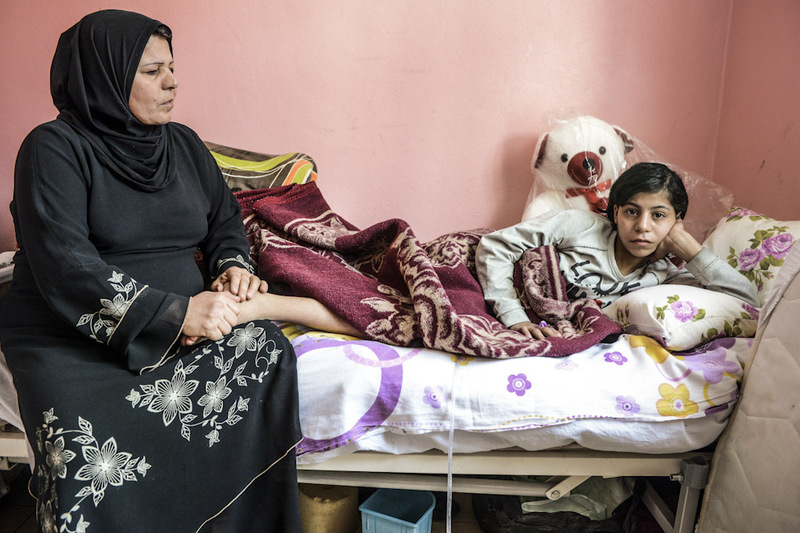 Nov., 2012 - Raqqaia, a 12 year old from Dara'a, Syria, lost her right arm in a bomb blast near her home in July 2012. Her mother was also injured and 3 of her sisters were killed. 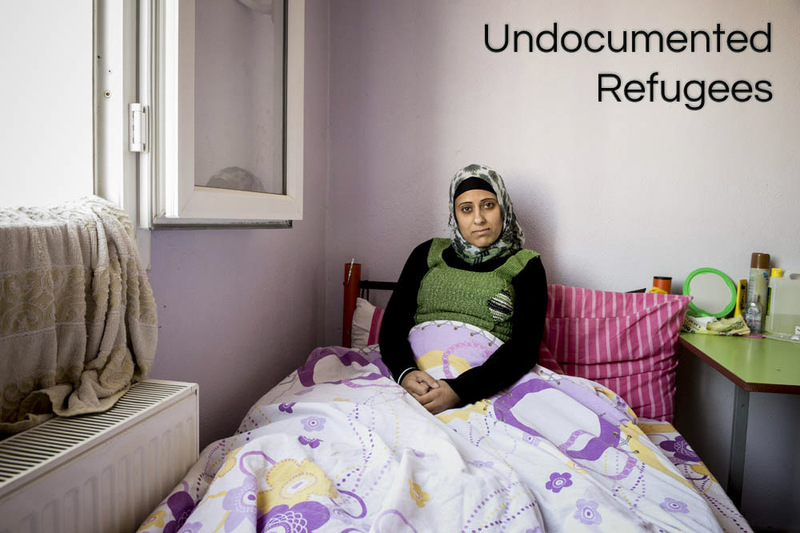 Raqqaia now lives with her mother and several other members of her family in Irbid. Amman, Jordan. March, 2013 - Wasa 19 and Emad 50 from Dara’a, Syria. On August 19, 2011 Emad, Wasa, his daughter and his wife were attending a demonstration against the regime of President Bashar al-Assad. His wife is an activist for the revolution and was filming a documentary about what the regime is doing. Out of nowhere, a sniper's bullet hit Emad in the head. Now he is unable to walk or speak. Five years ago he was working as a nurse for one of the secret intelligence agencies. There are 16 intelligence agencies in Syria called the Shahiba. Often, the Shahiba throw individuals into jail for no apparent reason and do not tell their families of their whereabouts. Emad on one occasion was begged by a prisoner, who was a patient, to tell his family he was in prison. Emad informed his parents. Then a second patient asked for the same favor. Emad declined, fearing the Shahiba would find out. The second patient then went to an intelligence officer and disclosed the information about Emad. Emad was thrown in prison for 2 years. The family is now living Amman, Jordan waiting for the war to be over so they can return home to Syria. The apartment they are living in is provided by The Syrian Women's Association. Irbid, Jordan. Dec., 2012 - Mohammed 35, from Dara'a. His body was hit in four places by a sniper in June, 2012. He is now paralyzed from the waist down and lives with his wife and daughter. Irbid, Jordan. Nov., 2012 - Ammar is 7 years old and is from Dara'a, Syria. He lost his right arm and leg in a bomb blast in July 2012. 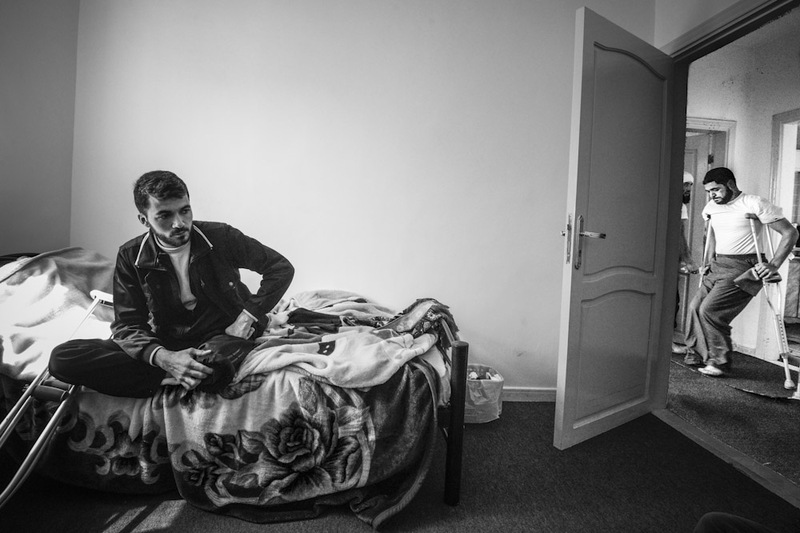 The rent in an apartment in Irbid is expensive for his family and they may have to move back to the refugee camp soon. Irbid, Jordan. 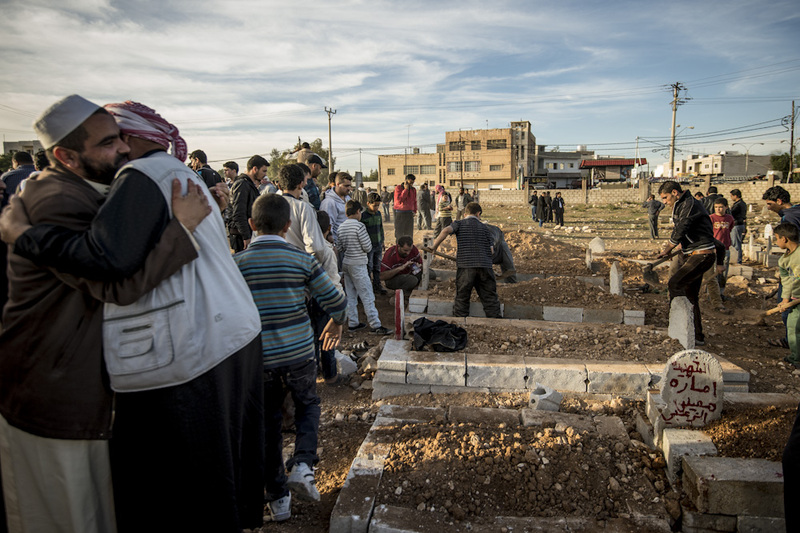 Dec., 2012 - A funeral procession of Jordanian and Syrian men leave the mosque where they had attended the funeral for a young Syrian child and two others. They were in route to the cemetery. Irbid, Jordan. Dec., 2013 - A young child being buried. Most of her family had been killed in a bombing in Dara'a, Syria the day before. 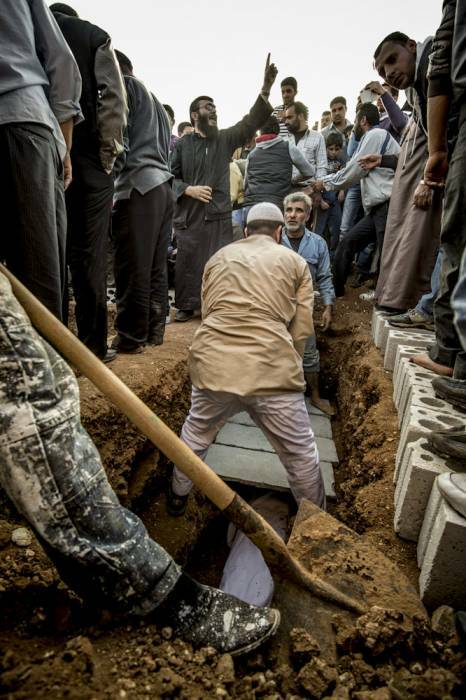 None of the Jordanian or Syrian men at the burial knew her, but wanted to pray for her in the absence of her family. Irbid, Jordan. Dec., 2012. Three Syrians were buried in this cemetery on this day. This section of the cemetery was designated for the Syrians when the refugees began to escape and bring their injured to Jordan at the beginning of the revolution. Project Description: The Civil War in Syria is now in it’s third year. At the time I am writing this there are approximately 70,000 who have lost their lives and well over a million refugees in Jordan, Lebanon, Turkey, and Iraq. 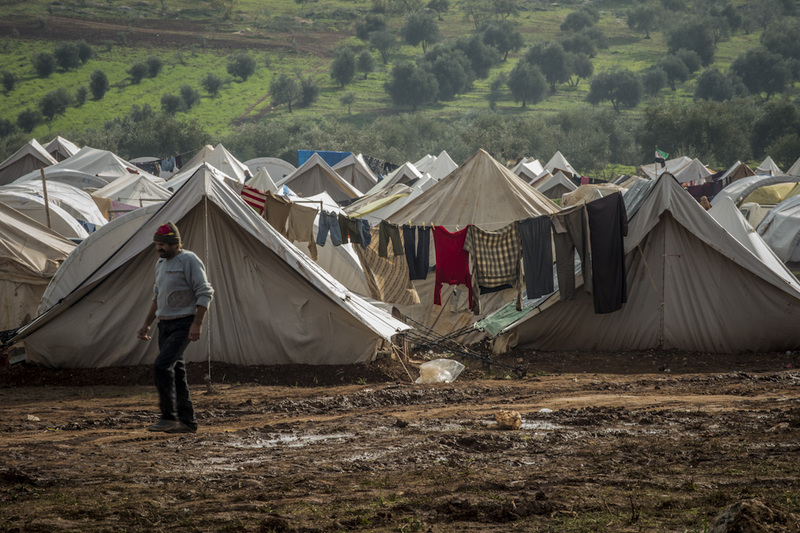 The number of displaced persons who have fled their homes and the violence still living in Syria is around 4 million. These numbers are rising rapidly every day. The number escaping to Jordan is over 1 thousand daily. At the beginning of the Revolution in March, 2011, Syria had been under the the present leadership of the Assad regime since 1961. In 1961 it was Bashar al-Assad’s father, Hafez, that headed the regime. Bashar took over the Presidency when his father died in June, 2010. The Assad family belongs to a minority sect, the Alawite, which is 7% of the population. The Revolutionaries in Syria are members of the majority sect, the Sunni, who are 70%. There are several other minority sects: Christian, Shiites, Kurds and Druze. Since the beginning of the Assad regime, the Sunni have lived under brutal suppression administered by the 16 branches of the intelligence, the Shabiha. I was told by individuals who I interviewed that the Shabiha are essentially protection rackets, extorting money, torturing and sending people to prison for little or no reason. In March, 2011 the Sunni majority had had enough and with the forming of The Free Syrian Army, the Revolution began. In March of 2012 I was in Jordan on my way home from working on another project in Afghanistan. It was by chance that I was taken to the north of Jordan and introduced to some of the first refugees to flee the Syrian conflict. I immediately became saddened and horrified by the stories of the refugees and the wounded. I returned to The Middle East in November and December of 2012, and then again in February and March of 2013. The project, Breaking Apart - The Syrian Conflict, expanded to include Lebanon, Turkey and Syria. I was overwhelmed by the sheer number of refugees and wounded. 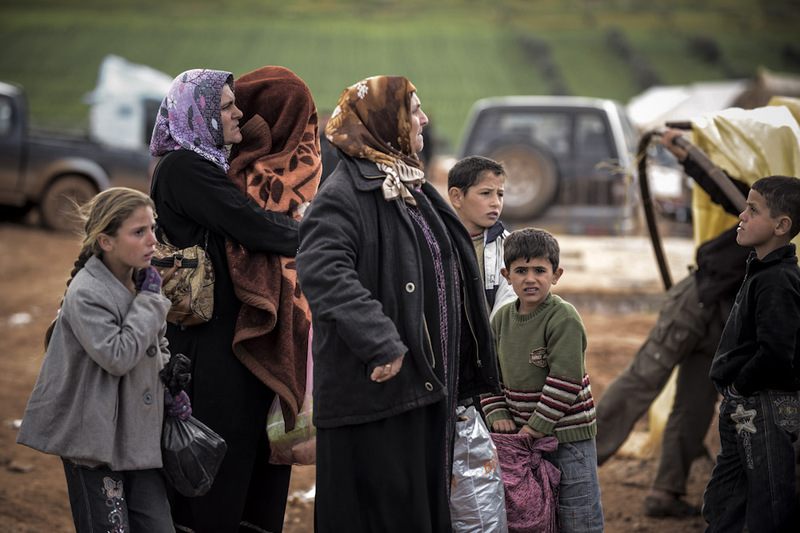 In addition, on the Turkish-Syrian border there were thousands of displaced persons. All of the Syrian people that I interviewed reiterated the unbelievable terror, torture, and human rights violations. I have photographed many families and individuals who left their homes with nothing. 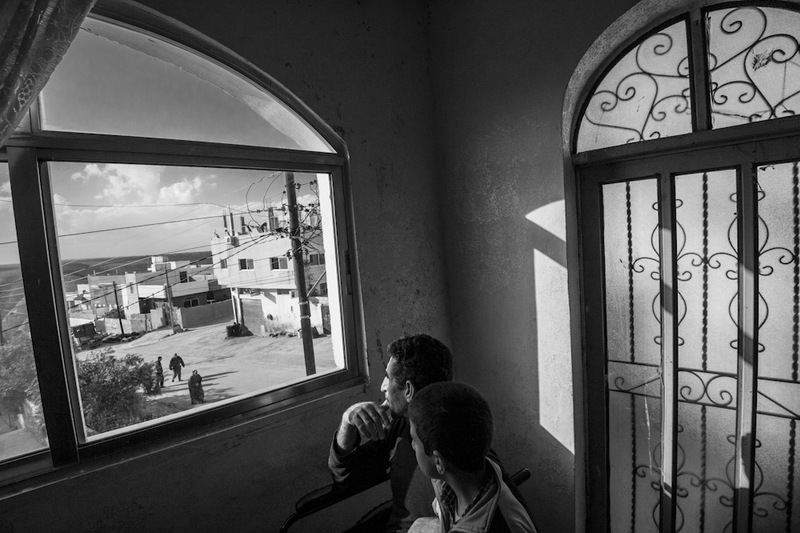 I am currently documenting their lives in refugee camps, makeshift homes, and clinics. I am photographing their day to day life and how difficult it is to survive knowing that your homeland is being destroyed. Many live with the knowledge that remaining family and friends are being tortured and killed. 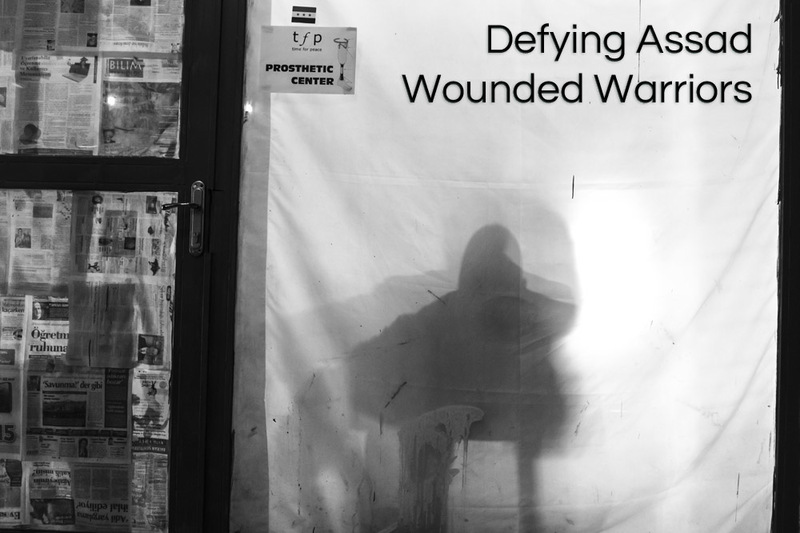 Also, I have photographed many wounded warriors, many of whom will return to the battle as soon they have recovered. Many of them will not be physically able to fight, but they will continue to help the revolution in any way possible. The future of the Middle East will largely be determined by the outcome of the Syrian conflict. Therefore, the events unfolding now in the lives of these refugees need to be documented. The stories and photographs of the people who are fleeing are as important as the stories and photographs of the fighting armies. For the world to be informed of the complete truth of what is happening in Syria, the stories that I am photographing and recording need to be seen and heard. Many Syrians expressed wanting to live in a democracy, but there is little understanding of what that means and what it would take to make that happen after living under a brutal dictatorship for so long.